OSHA requirements for work platforms have always been horribly complex. But since January 2017 when OSHA completely rewrote the standard 1910 Subpart D: Walking Working Surfaces (the standard that serves as the authority on work platform compliance), it's been nearly impossible to get a straight answer on what our fall protection needs to have to comply. Want an easy checklist to make sure your equipment is compliant? Download the 2017 OSHA Compliance Checklist here. The OSHA standard for fall protection had been in dispute in the decades leading up to the January 2017 final ruling. The basics of the update established the requirement for employers to protect workers from fall hazards along unprotected sides or edges that are at least 4 feet above a lower level. It also established requirements for the performance, inspection, use, and maintenance of personal fall protection systems. 1. Any working surface 4 feet or higher must be protected with guardrails on all sides at least 42" tall. OSHA 1910.29(b)(1): The top edge height of top rails, or equivalent guardrail system members, are 42 inches (107 cm), plus or minus 3 inches (8 cm), above the walking-working surface. The top edge height may exceed 45 inches (114 cm), provided the guardrail system meets all other criteria. This may be the quintessential OSHA requirement for work platforms. Any work area four feet or more above the next level lower MUST have guardrails. Period. The guardrails must be on every open side of the platform, excluding openings. The only time railing is not required is when the platform is up against another vertical surface (like the side of a helicopter). In that case, it is still critical to ensure railing covers any gaps. Don't forget: when you're performing manufacturing or maintenance tasks, there is a good chance you will be setting tools, parts, and hardware on the floor beside you. In order to prevent a wrench from falling off the platform and smacking a coworker on the head, 3-1/2" tall toeboards are required on all open sides of the platform (excluding openings). Guardrail systems should also be capable of withstanding 200 pounds of force applied in a downward or outward direction. 2. The platform's height cannot exceed 4x its base width. 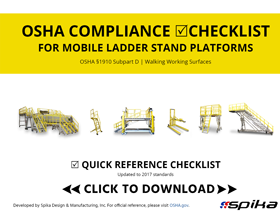 OSHA 1910.23(c): The maximum work-surface height of mobile ladder stands and platforms does not exceed four times the shortest base dimension, without additional support. If you need to access something at a great height but have limited space, consider requesting a stand with extended caster beams that can slide underneath your equipment and maintain this 4:1 ratio. These outriggers will provide enough of a base to keep your platform stable. Some companies even offer inboard outriggers which can lift up and over obstacles on your equpiment, such as helicopter skids. 3. Stairs must be at least 16" wide, 7" deep, and have no more than 10" of rise between them. OSHA 1910.23(e)(1): Mobile ladder stands and platforms have a step width of at least 16 inches (41 cm). Steps are uniformly spaced and arranged, with a rise of not more than 10 inches (25 cm) and a depth of not less than 7 inches (18 cm). 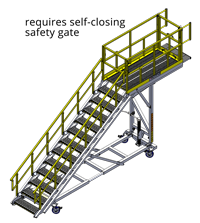 If you need a height-adjustable work platform with stair access, the best option for OSHA-compliance is a variable pitch staircase. The Spika-developed Variable-Pitch Staircase maintains consistent step interval at any height and ensures you comply with OSHA standards, no matter if you have 2 feet or 12 feet of vertical travel. 4. Self-closing safety gates are always required around openings (like ladder holes or staircases), unless the opening is offset and nobody can fall directly through the hole. OSHA 1910.29(b): When guardrail systems are used around holes that serve as points of access (such as ladder ways), the guardrail system opening (1) has a self-closing gate that slides or swings away from the hole, and is equipped with a top rail and mid-rail or equivalent intermediate member, or (2) is offset to prevent an employee from walking or falling into the hole. Self-closing safety gates are critical for OSHA compliance; you have to ensure that your technicians cannot back through a hole in the guardrail or push the safety gate open without intending to. Safety gates can either be spring loaded that close behind you when you enter the platform, or they can utilize latches for times when you have to have the safety gate open outward. For extra safety precaution, consider using an interlock mechanism to ensure the safety gate cannot be opened when it's unsafe. 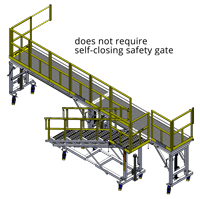 Some work platform systems come with an independent staircase that attaches to the deck at multiple points. With this versatility, you can configure the staircase in a way to prevent your technicians from walking directly down the staircase. This is the only time in which a safety gate is not required. This is a good option for techs that are carrying items up and down the staircase and might not have the hands available to open the spring-loaded gate. 5. The platform must be tested to 4x its rated capacity. OSHA 1910.23(e)(1): Mobile ladder stands and platforms are capable of supporting at least four times their maximum intended load. Technicians can wonder if their work platform will fail them if they need to carry an excessively heavy tool onto the deck or need a little extra help from fellow technicians to perform a task. It's highly unlikely that a failure like this will ever happen, as quality manufacturers of work platforms actually test the structure to 4x its load rating in-house to make sure there will be no failure before sending it to the customer. The number of safety standards that apply to work stands can be overwhelming. If you're unsure whether your platform is in compliance, ask the experts. It's not worth risking injuries, fines, and decreased employee moral, and often one little fix can bring you into full compliance. For more information on employer deadlines, new terminology, and a at-a-glance guidelines for mobile work platform compliance, download the checklist below. Are you interested in seeing what your OSHA-compliant work platform could look like? Also check out these posts!